Horse Trainer Chris Cox interacts with unbroke, three-year old filly, Katie. "At age 18, I had a dream to become a horse trainer, so I returned to the United States," says American-born, Australian-raised, Chris Cox. Not yet 35-years old, Mr. Cox has been holding clinics, internationally, for nearly 12 years. On July 17, courtesy of the Circle S Ranch, he demonstrated his basic horse training methods to a gathering of nearly 100 local cowboys and cowgirls. From the time Mr. Cox entered the metal-paneled round corral at 10 a.m., until he sat astride Katie at 11:30 a.m., Chris held the audience captive with his wit, philosophy, and stories of his successful training methods. He then asked us to watch Katie's own unique personality emerge as he proceeded. 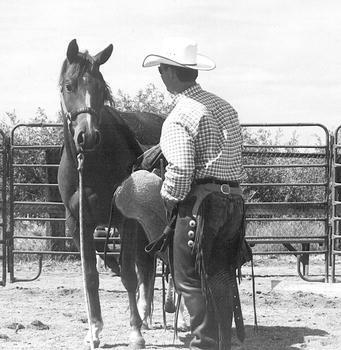 Mr. Cox downplayed his techniques, but rather, emphasized that the key to good horsemanship is to connect with a horse's way of thinking. He compared his interaction with horses to the way he approaches people. "I want a horse or a person to want to meet me when they're ready. I want them to allow me to walk up and look them in the eye. I like to address and approach them like I normally would. I don't do anything different." He simply prefers to be himself, so there'll be no surprises later. 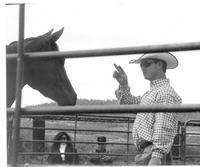 "Watch the eyes and ears of a horse to communicate with them," Mr. Cox continued. "It's the window to their mind." He proved this point by demonstrating his pressure and release method - walking toward the jittery mare until she looked at him, then quickly walking away. "For the horse, this release is like finding an open door." Mr. Cox wants to make the right things easy for a horse and the wrong things hard. "I don't stop them from doing something wrong, I just correct it." And he stressed that he won't proceed with a horse's lessons until a problem is corrected. To fully understand a horse, Chris watches for subtle moves most folks don't see - for example - licking their lips to get the saliva flowing while trying to relax; making slight changes in the position of the eyes and ears; or how the body responds when he pulls up the cinch. "I want a horse to look to me when it gets into trouble. I want that trust and respect," says Chris. He doesn't believe in using a heavy, forceful hand, but he isn't entirely soft-handed, either. The arena dust rose and drifted a bit from time to time as he stirred Katie into action. "I want a horse to trust me; to come to me when it's in trouble." 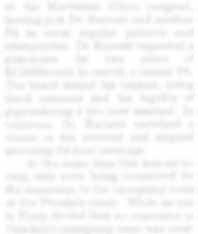 Chris cited the human parallel in the recent school shootings, concluding that the kids involved didn't have the proper, early foundation and training. They didn't know where to turn for support. He added, "Horses and houses are much the same when it comes to foundations, and if you don't build a good one in either, you're going to have problems later." "Horses are a big part of my life," says Mr. Cox. And he knows that horses are working their way into the hearts and lives of more and more people. But he sees "too many good horses going to slaughter," because their owners didn't have the knowledge to prevent problems and weren't willing to take the time to learn the basics. "We've got to learn from each other," Mr. Cox said. "Horses are getting smarter; we're breeding the best of the best and to get the best from them, we must all work together."